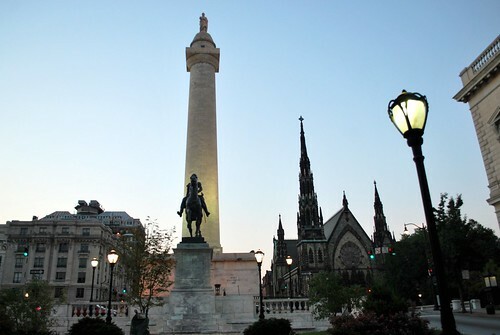 As I mentioned in yesterday's post about the Baltimore Washington Monument, this next post is going to be about the area around the monument which is referred to as Mount Vernon Place. Technically there are two distinct areas that branch out from the circle that surrounds the monument and form a Greek cross. 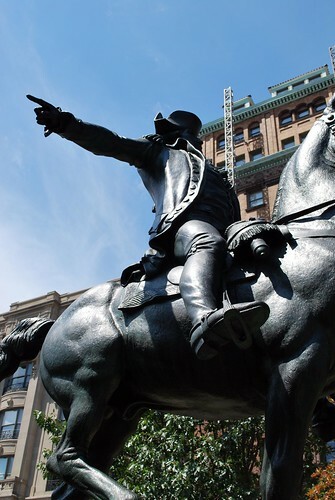 The squares to the east and west are called Mount Vernon Place, while the north and south squares comprise Washington Place; however, it seems that most people lump the two areas together and for the sake of argument call the entire area Mount Vernon Place - which is what I'm going to do! As I mentioned yesterday, when the townspeople of Baltimore decided they wanted to erect a monument for George Washington the initial idea was to build it closer to town but due to a fear that the massive structure would collapse on neighboring houses, the monument was constructed on land located outside of the town itself in an area known as Howard's Woods. 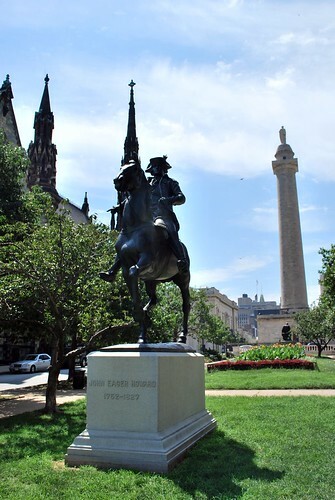 The land on which the monument was to sit, as well as surrounding property for the building of parks, was donated by Colonel John Eager Howard who had served under Washington when both fought in the American Revolution. A favorite native son of Baltimore, John Howard was the fifth Governor of Maryland as well as holding the title of State Senator from 1796 to 1803. Colonel Eager was born and died at the family's palatial estate in Baltimore known as "Belvidere" and it was part of that estate that eventually became the Mount Vernon section of Baltimore. After Colonel Howard died in 1827, just two years before the completion of the Washington Monument, his heirs sold lots that bordered the parks and monument. 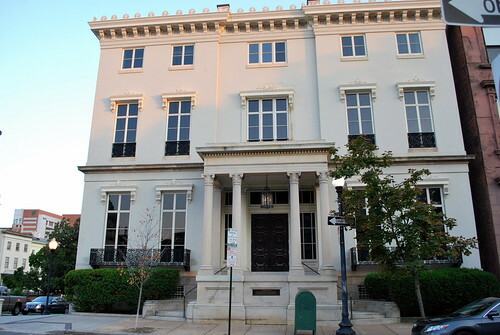 Baltimore was the fastest growing city in America during the first few decades of the 19th century and by the 1840s some of the city's most gracious townhomes had been built in the lots around the monument by some of the city's most prominent families. Unfortunately, I didn't get as many pictures as I would have liked when it comes to the beautiful homes around Mount Vernon Place as I was too busy looking at the parks themselves and the sculptures there. It wasn't until I got home and started doing research that I realized that I had been in the presence of some very grand homes of some very grand people which I guess means another trip down to Baltimore will be in order one of these days! Perhaps if/when Claire ever gets her cheeky ginger-topped self back over to this side of the Atlantic I can talk her into a jaunt down there! At any rate, I did get pictures of The Hackerman House which is the second oldest house on the square built between 1849 and 1851. The home was originally known as the Thomas-Jencks-Gladding House which was designed using the Italian Renaissance features then in fashion. The house was built for John Hanson Thomas, a descendent of John Hanson, President of the Congress under the Articles of Confederation. At the time of its construction the house was described as "one of the most elegant and princely specimens of architectural taste and mechanical skill." It may not look all that grand from the outside but I've heard that the interior is just gorgeous. Unfortunately, it wasn't open while I was there so I'm going to have to take the word of everything I've read! The house changed hands several more times before Mr. and Mrs. Willard Hackerman presented the house to the City of Baltimore in 1984 and in 1991 it was remodeled for museum use and now houses the famed Asian art collection of the Walters Art Gallery which is just around the corner from the Hackerman House. 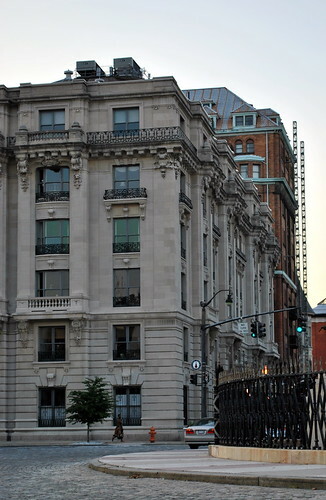 The gallery, modeled on the University of Genoa's University Palace, holds the tremendous art collection that was amassed by William and Henry Walters in the late 19th and early 20th centuries and given to the people of Baltimore on Henry Walters death in 1931. 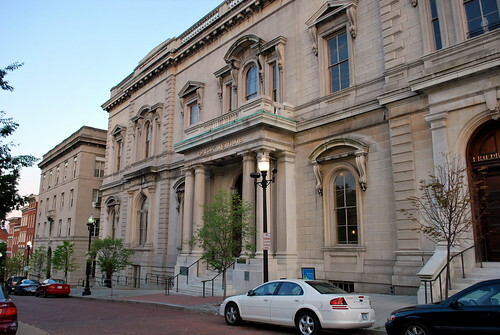 Across Charles Street from the Hackerman House stands the original building of The Peabody Institute - the oldest continuously active music conservatory in the United States - which was built between 1858 and 1862 but not dedicated until after the Civil War in 1866. In 1857 George Peabody, an entrepreneur and philanthropist originally from South Danvers, Massachusetts, wrote to 25 leading Baltimore citizens outlining a specific proposal to create a cultural institution in Baltimore. When his gracious offer was accepted, he insisted that it be built on this site which was one of the most expensive and prominent locations in the city. 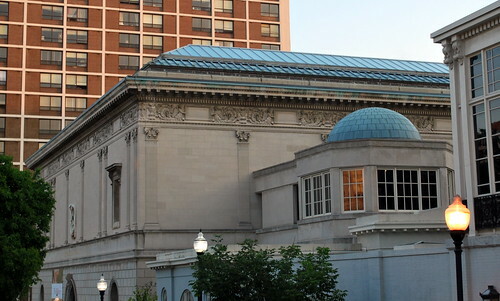 The building was designed in the Renaissance Revival style and it's most most impressive feature is its large central reading room which rises to the full height of the building under a skylight, with six stories of alcoves giving room for 300,000 volumes. Another building I gotta into one of these days! Directly across the street from the Peabody Institute on the northeast corner of Mount Vernon Place sits the Mount Vernon Place United Methodist Church but I'm not going to say anything more than that in this post as I've got a full post on the church alone and you're just going to have to come back for that one! Claire isn't the only one who can be cheeky! 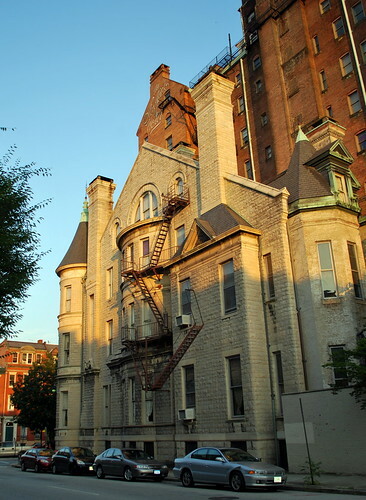 In addition to the other beautiful buildings surrounding the Washington Monument , North Washington Place hosts two large apartment houses, the Washington Apartments built in 1906 in the Beaux Arts style and the Stafford Apartments (originally Hotel) which was built in 1894. At the northwest corner of Washington Place stands the Graham-Hughes House, a grand 1895 example of a French chateau-style townhouse. In addition to all of the lovely buildings and examples of gorgeous architecture that line the streets around the Washington Monument there are four parks but I think we're covered enough for one post. After all, I don't want to overload you with too much history just in case there's a quiz later! You have a new page complete with Train... love it and the Baltimore pictures are wonderful. Look forward to seeing more. Did you happen to get any of the Synagogue? It is a truly interesting building as well. Oh, look! A train header! I love the first photo in this post! In takes in so much! Maybe once Amanda gets to Beverly, she can fill you in a bit more about Peabody and Danvers! There's a few nice beaches she may want to check out, too. Although I'm sure her fellow students will have their favorite haunts. And we still have to figure a plan... I'm already seeing that 12 days is not enough time to fit in everything I want to do while I'm up there! I would like to know how many people take the time to learn what they are taking photos of, good job. I like your new look. wow, I need to get myself downtown to see all of those lovely buildings! And the photos you take are just so crisp and clear. I learned a lot from your post. A fine tour of Baltimore. I like the template. Ids that a zombie driving the train? 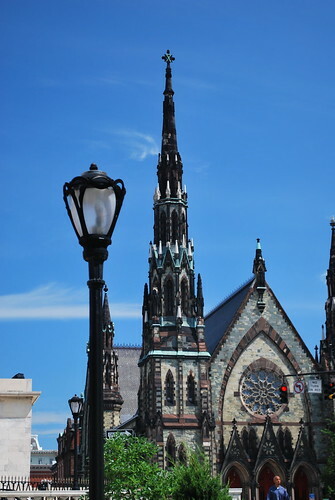 Who knew that parts of Baltimore look like Paris? I'm astounded. I also forgot to say I like the vibrant red! It doth wake me up.. I guess Peabody, Mass. is named after Mr. Peabody. 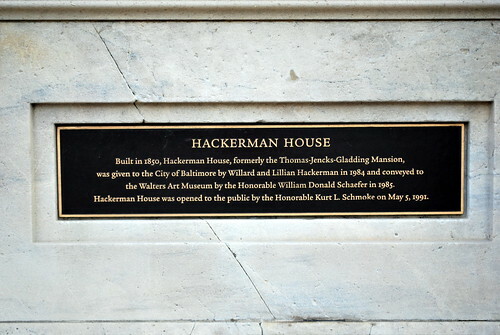 Too bad the Hackerman House wasn't open when you were there. Looks intriguing.